Ananka's Diary: It's High-Tech Wednesday! The Japanese have created a new fire alarm system for people with hearing disabilities. Instead of a loud, piercing shriek, the alarms emit the powerful odor of horseradish. You may end up with a pounding headache, but at least you'll get out alive! 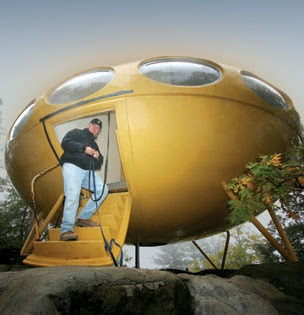 A flying saucer house was recently on sale in Chatanooga, Tennessee. It came complete with "three bedrooms, two baths and an staircase that retracts with the push of a button." Very cool. According to London's Daily Mail, spies may be getting a lot smaller in the near future. Scientists say that ordinary insects may soon be implated with tiny cameras, radio controls, and microphones. A company called Boston Dynamics has just released videos of their new Big Dog Robot. Intended to be a "pack mule" for soldiers one day, its movements are so realistic it's almost creepy! Back in January, a "monkey made a 200-pound, 5-foot humanoid robot walk on a treadmill using only her brain activity. [The monkey] was in North Carolina, and the robot was in Japan." And finally, for all you dog lovers out there, new research indicates that dogs may be able to read people's minds. XD I showed the dog to my sister and she thought it was a DEER! and and my little seven year old friend thought it was a monkey. uh oh...I smell horseradish! Gotta go! Ananka: the shirt is awesome!! I love it! Ananka: Is the city under the Green Mill open to the public? i want a ufo house!!!!! 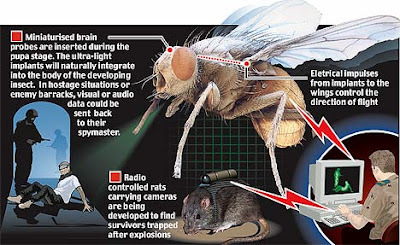 more reasons to swat flies! Raph: Or they would get burned to a crisp when there was one! I do not appreciate the bug spies. That is animal testing, which I do not like! If we're so smart, why don't we turn people into bugs using science? However, I printed out the dog article to show my reading teacher, who does not think dogs have thinking capability. I knew it, I just needed proof! Jin Ai: GO HARRY POTTER!!! I was always convinced bugs that fly were suspicious. MARCH 19 IS MY BIRTHDAY!!!!!!!! !